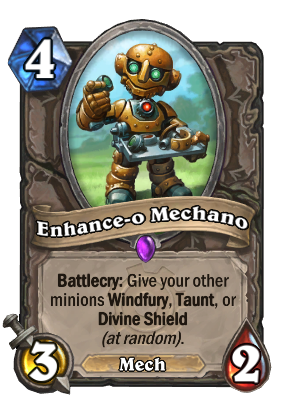 Wanna pay my respects to this lil' guy, lost count of how many times he windfury'd a sea giant or leeroy or just single handedly won the game vs control classes. One of the best designed cards in the game, also insanely fun. Is it card worth crafting? Does it fit in Mage? Only if you are playing Zoo (Wisp/Flood/Hob) or something with a lot of sticky minions - he's a great surprise that is not expected. Can't see him working in mage at all, though. I just build a new Zoo deck and this card works amazing for me, it adds a fun factor to the deck! This card works really well mainly because it is effortless to establish 4 or more minions on board with Zoo and having those buffs is great ([card]Power Overwhelming[/card] on windfury is great). If someone never tried it in Zoo, give it a shot, it is a blast to get those buffs on full board with Zoo. What does his dialouge say when he gets summoned, dounds like "ENTRIKIMATATION COMMENCING"
My mech mage just loves him ! When buffing a few minions the opponent mostly just quit. Quite funny, if you're not on the receiving end of the board. Fill the board as Paladin, turn 3 Muster for Battle, turn 4 hero power and 2 cost minon, turn 5 this guy and abusive sergeant on a windfury minion. Very aggressive. Seen some forfeits when this is played optimally. Hard to get those 1/1 minions to survive that long though as many other AOEs are within that range of mana. (Holy Nova, Consecration, Lightning Storm, heck even a whirlwind will do xD). This card balls hard. Pseudo-protection from AOE because of the Divine Shield, extra burst from Windfury, and I guess taunt is okay. This card is one of those cards that seems to work AMAZINGLY for everyone I face and gives me the worst possible outcome every time I use it. It drives me crazy!!! Just got this card in arena and in first performance it was like perfect trolling how it distributed abbilities. I had 2x silver hand recruits, 1x ,0/1 frog, 5/5 stranglethorn tiger, 2/3 amani berserker and 2/1 bluegill warrior just played. So I played this card and the result: 0/1 frog as only card to gain windfury amani berserker was only card to gain divine shield. All my recruits, murloc and tiger got taunt. I won the game anyway, because my big board advantage was too big, and shaman opponent had no lightning storm.